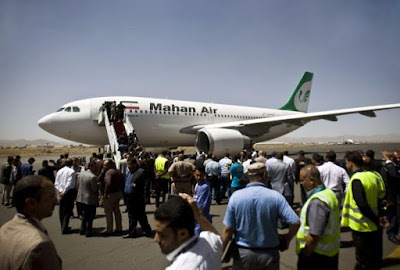 For at least five years, Iran has been using commercial airliners from Mahan Air (an IranAir subsidiary from what I can gather) to ferry terrorists and weapons from Tehran to Damascus. Now, thanks to the Obama-Kerry sellout and the lifting of sanctions Iran (having been blocked by Congress from purchasing from Boeing) is about to buy 500 new jets from Airbus, the European consortium. Iran currently has 50(!) commercial jets. Imagine how much more trouble they can make with 500. Forbes said Iran was trying to ink a deal to buy up to 500 aircraft over the next decade. The report coincides with the comments of U.S. Secretary of State John Kerry, who expressed his country’s worries regarding Iran’s transfer of weapons to Yemen. Also, the international community is worried from an Iranian activity towards refueling conflicts in Arab countries, which Tehran says was protecting its security and national interests. Last Thursday, Iran announced that a deal with Airbus was in its last phases,” according to Fars news agency, quoting Iranian Minister of Transportation Minister Abbas Akhoundi. Forbes warned the Airbus Company to think twice before inking such a deal. It said Iran’s current fleet stands at 36 aircraft while its subsidiary, Iran Air Tours, has 14. Mahan Air is considered the first Iranian company, which conducted flights to Syria for transferring weapons in 2011. Yet another frightening installment in the Obama legacy. What could go wrong?